Conservatively rated to 0ºF (-17.777ºC) the Sierra Sniveller was designed with the ground sleeper in mind. It is wider (52 inches) at the shoulders and down through the hips to eliminate drafts, and tapers to 42 inches at the foot end. Six lacing tabs have been added to the sides to secure the quilt around a pad if desired. Form the foot box and use as a top quilt or wear as a serape using the non-snagging, mixed hook & loop re-sealable head-hole. The standard footbox is formed with a drawcord, cord-locks and double-sided Kam Snaps. This allows the quilt to be left as a blanket for easy venting, a foot-box to be formed, or multiple quilts to be stacked in colder temperatures. 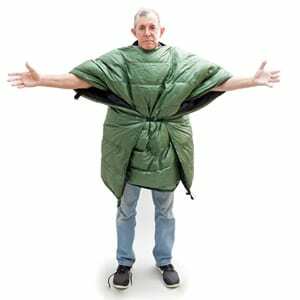 Lighter than a similarly rated sleeping bag. No squirming around to get in and out. Easy to vent for temperature control. It was designed with the ground sleeper in mind. It is wider (52 inches) at the shoulders and down through the hips to eliminate drafts, and then tapers to 42 inches at the foot end; the foot box has been lengthened for better tuck control; and six lacing tabs have been added to the sides to secure the quilt around a pad if desired. Form the foot box and use as a top quilt or wear as a serape using the non-snagging, mixed hook & loop re-sealable head hole. For individuals over 5 feet 10 inches tall we offer a long version (86″ in length) of the High Sierra Sniveller specifically for use as a top quilt. First of all WOW!!! this thing is warm. And dual purpose. At 30.5 oz. the High Sierra Sniveller top quilt is one of the best. Also its practically 2 day shipping. It is alot of $$$, But This is definitely A get what you pay for thing here. I’m an active side sleeper that sleeps hot and almost always has my feet out. Traditional rectangular bags with a full two way zip work well enough for me camping but they come with a lot of extra weight and bulk thats less desirable for backpacking. Standard Mummy bags are not too bad if you find one roomy enough to toss and turn in but almost all have a fully enclosed foot box for 12″-18″ that make sticking you feet out awkward or impossible. Even many quilts have a fairly deep, fully enclosed foot box thats a problem for folks like me. Enter the High Sierra Sniveller. You can use it as a perfectly flat quilt. You can build a foot box (velcro, snap, and drawstring) thats anywhere between fully open on the bottom and fully closed. There are several loops along the edges you can use to lace the quilt under you or your sleeping pad. ; and a drawstring around the top to help prevents drafts around your neck and shoulders. There is even a velcro head hole in the middle of the quilt in case you want to wear it as a poncho. 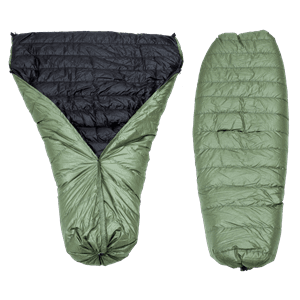 Because of its design it can be comfortable within a much larger temperature range than a sleeping bag with a similar warmth rating. Incredibly versatile. The quality of the materials and workmanship look excellent. The materials feel like a nice compromise of fairly light weight yet durable. It’s nice an soft, compresses very well and re-lofts well. Ultra-lighters will appreciate the large silnylon stuff sack that comes with it (1.5 oz) that works very well but is a bit slower than a heavier traditional compression sack. I can’t vouch for its temperature rating or moisture resistance yet but I have no reason to doubt it. It was plenty warm in dry 40 degree temperatures just using it as a flat quilt. It was wide enough and long enough and settled enough not to be drafty as I tossed and turned yet I could keep things stuck out to stay cool enough (where I’d be sweating in a similarly rated mummy bag). So I thank the Jacks for great product! I am disappointed by the quilt. I roll over when I sleep and there is not enough down in the baffles to stay in place. I wake up cold because there is no down above me. It falls to the sides of me. I have to get up and shake the down back to the middle at least twice a night. If it is really cold I have to do it more often. I am going to have to get more down put in if I am to make it through an entire night of sleeping. 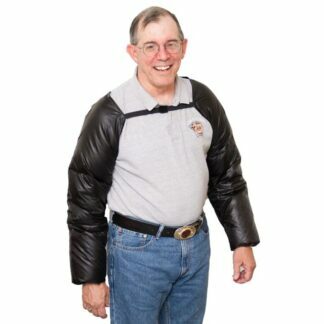 It is warm as a jacket when wrapped around my body. Unless there are changes I would not recommend this to a ground sleeper unless someone can tell me how to fix this problem. This is a follow up to a review I wrote a month and a half ago. I am a huge fan of a company that stands behind what they make and sell. After I wrote a review that was only 2 stars they promptly responded to me by calling me to talk about the issues I wrote about. I had a very nice conversation with Jack of course. We discussed many aspects of being a ground sleeper with a quilt. I spend about 200 days a years sleeping under the stars and so quality and functional gear is very important to me. Jack talked about possible reasons why the down could be shifting on me and how to correct this through how I sleep. 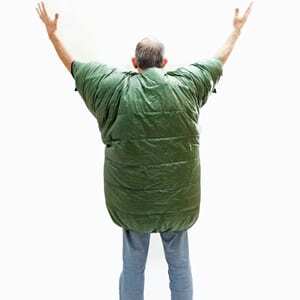 We discussed sleeping pads, the way I roll over, how if you pull the bag tight when cold it pushes your shoulder into the down and windshield wipers it to the sides, how to not pull it over your head so moisture from your breath decreases loft and more…. It was a very information packed phone call. I really appreciated all the time and effort put forth to do this with me. It could be beneficial to write this up and put it on the website for all new users. They also agreed to have me send it back so they could check out the amount of fill that was in the baffles in question. They added a little more down to those baffles, cleaned it and even added some new snaps to the sides. They went above and beyond what I expected from start to finish with my review. They also posted the “negative” review which I often wonder about. The entire process of sending back the quilt was almost too quick to believe. I sent it and had it back in-between my shifts in the wilderness. I had it back for my shift with days to spare. I am a big fan of the multi functionality of the quilt. I have to carry too much weight for work already so a jacket and sleeping bag in one that now works well for both is a wonderful piece of gear to have in my pack and in camp. I have used it down to 0 degrees and been plenty warm. The materials seem to be very high quality and comfortable. I am excited to get years of use out of this quilt. I look forward to writing a review after I wear this one out and am purchasing a new one so I can see the improvements they continue to make as they learn more about their quilts. This one is nicer than the one I had years ago as there are more baffles. 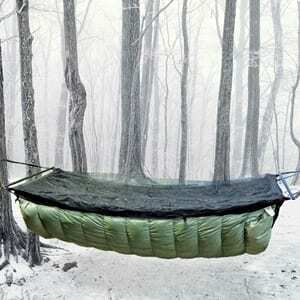 In the past, I utilized a heavy single or multiple base layers under a top quilt for winter hammock camping. Using the High Sierra Sniveller top quilt over me, a thin fleece top and regular long john bottom was all I have used staying toasty warm to 0° F. In the end, the High Sierra Sniveller enables me to leave extra sleeping layers at home saving room and weight in my pack. The High Sierra Sniveller performed great on my recent snow shoeing trek on the Black Forest Trail here in PA. As with all my JRB products the shell fabric is comfortable and no loose down comes flying out. A dependable product to snuggle warm under after breaking trail all day long in 3 feet of snow. Tons of down. 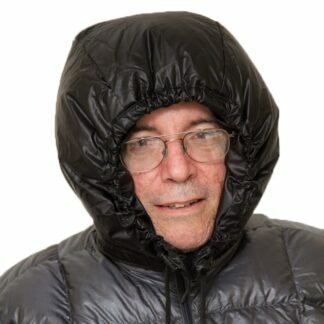 I bought one of these for my wife as a winter TQ, and even with her cold nature, she has been comfortable into the single digits several times. I feel I could sleep in it into the negatives without worry, but I’m a warm sleeper. As a bonus, on a trip to the Smokies we did last winter, a storm had hit and temps were much lower than we had planned for. Not only did my wife sleep warm in single digits with high winds, she wore the quilt in the morning during a chilly breakfast and pack up, and it definitely improved her morale. Happy wife, happy life! I love this quilt. I am on a 1 year trip around the world trip and I’ve only had this for a few months but it’s been everywhere, from 0 degrees to 70, and kept me feeling comfortable the whole way through. Works well with my neolite air mattress and a few clips. I also especially love the poncho mode for cold nights, which I didn’t think I’d really enjoy. I’ve sent 2 others to buy this. on a -27ºF trip I just took here in Minnesota. It took me well below the intended range. Nice to put it through a proper trial. Man….I LOVE that TQ. I have been very, very pleased with the High Sierra Sniveler. The quality of workmanship is excellent and customer service at JRB is outstanding! On New Year’s Eve I used the Sniveler when temperatures dropped to -16F with a 15-20 mph breeze. Since the forecast had pegged temps at -20F or lower, I decided to layer TQ and covered the Sniveler with my North Face Aleutian which is also rated at 0F. About one hour into the night, I noticed that I had begun to sweat, which raised alarms in my mind because of the plunging temps. I decided to open up the Aleutian mummy bag and only have it underneath my body and extending up somewhat on the sides of the hammock. I remained very toasty throughout the balance of the night with only the Sniveler protecting me on top. The prevailing breeze was moderated nicely by the top cover on the Chameleon. I would heartily recommend the High Sierra to anyone who is looking for a TQ worthy of really cold temperatures. I feel the 0F rating is somewhat conservative. I recently contacted don about the high Sierra sniveller, and after a couple emails and a call I ended taking his full advice with this quilt and also ended up getting a new sleeping pad that he suggested. 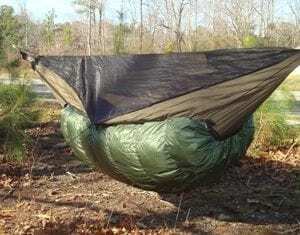 Well I couldn’t wait to try it out so last night I decided to run out to the garage throw down a tarp to protect the pad and give it a try.since I usually get cold at night very easy I was still expecting to be cold. Now it is 4am and the thermometer next to me is about 18*f and suprisingly not cold at all with just a pair of thermals on! Before this at 35* I had on every peice of clothes and my coat inside my bag and was miserable lol. Ok well now the bad part… um I have to get out of it and go to work. Yes I an currently procrastinating still wraped up in my new quilt writing this because I’m so warm! Do yourself a favor and give these guys a call!